Without too much cutting required, I managed to make 3 more sets of "winged" creature blocks from this particular collection of pre-cuts scraps. This swarm of on-point dragonflies just emerged quite accidentally as I was trying to find another way to build a butterfly. 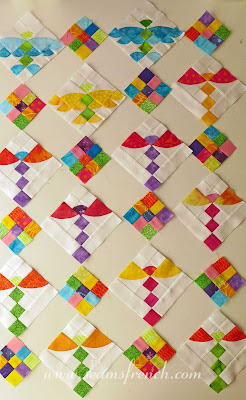 I call these "Kimono Butterflies". 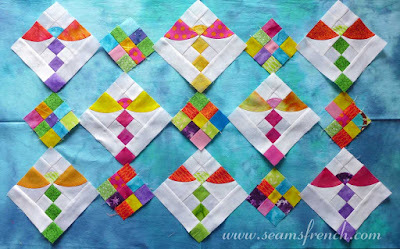 There are many images for similar blocks on-line, so I adapted the pattern as best I could to use up my pre-cut shapes. With the few bits and pieces of left over appliqued 1" quarter circles, a small swarm of "buggy things" emerged. Because there are so many pre-cut strips left over from the same project as the appliqued quarter circles, I just started sewing them together in sets of 3, knowing (well hoping), that the maths should work out. It has. Hurray! Many have now been cut into 9 patch blocks and there is a stack of them that could become corner stones, (as below), or may yet become blocks in their own right. Below are a few more layout possibilities. 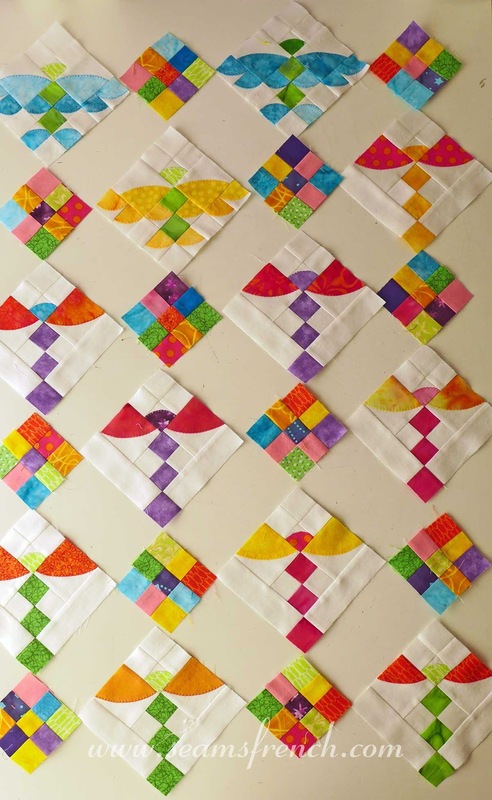 With all of the blocks that this stash of scraps will yield, more then one quilt is likely, especially since these will become kid quilts. 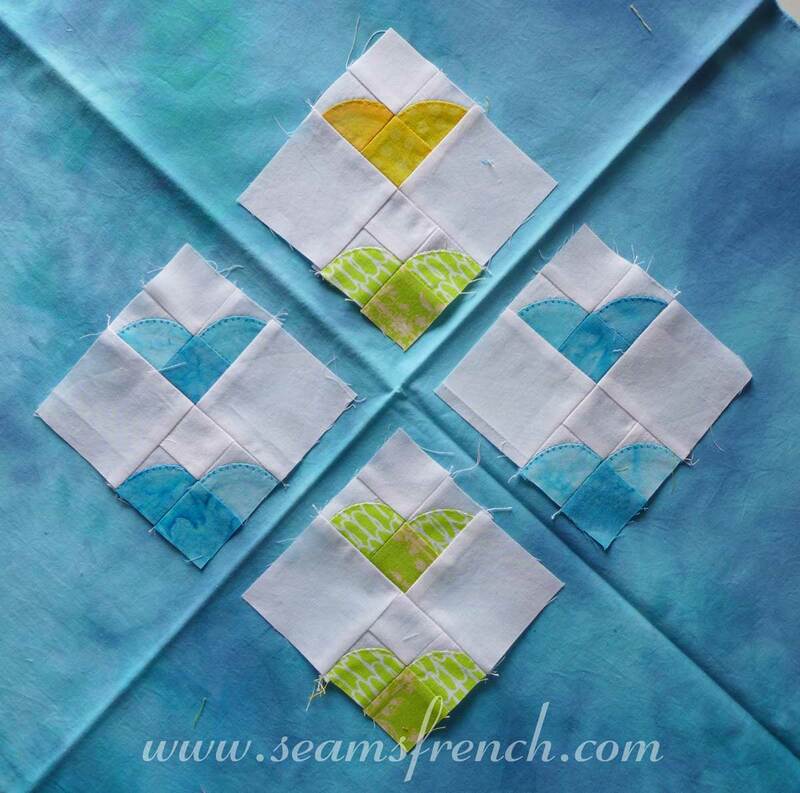 The 9 patch blocks could be sewn together and become the focal point in one of the quilts. Or they could be the corner stone with a solid coloured sashing joining them. The hand dyed blue fabric underneath happened to be handy for photographing. I will likely try it with a white sashing before I commit to a colour. 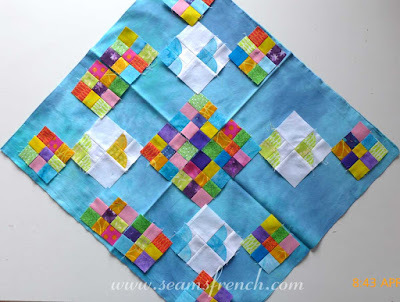 Or, if I really feel wild and crazy, I may just sash the blocks with more colour. I'll have to see where the spirit leads. 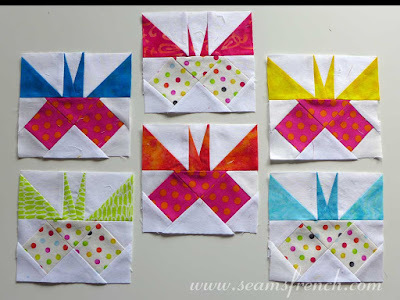 What cute blocks! 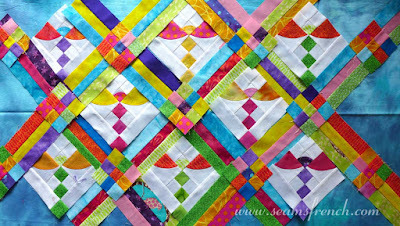 While I usually don't favor really bright colors in quilts, I like these, especially with the colored sashing strips. It makes a fun kid's quilt without the usual trucks, cars, princesses, cupcakes, etc. Thanks Cynthia. Away from quilts, neutrals seem to be the way I go with home decor, clothes, etc. So playing with a bit of bright colour in some of my quilts is always fun for me. 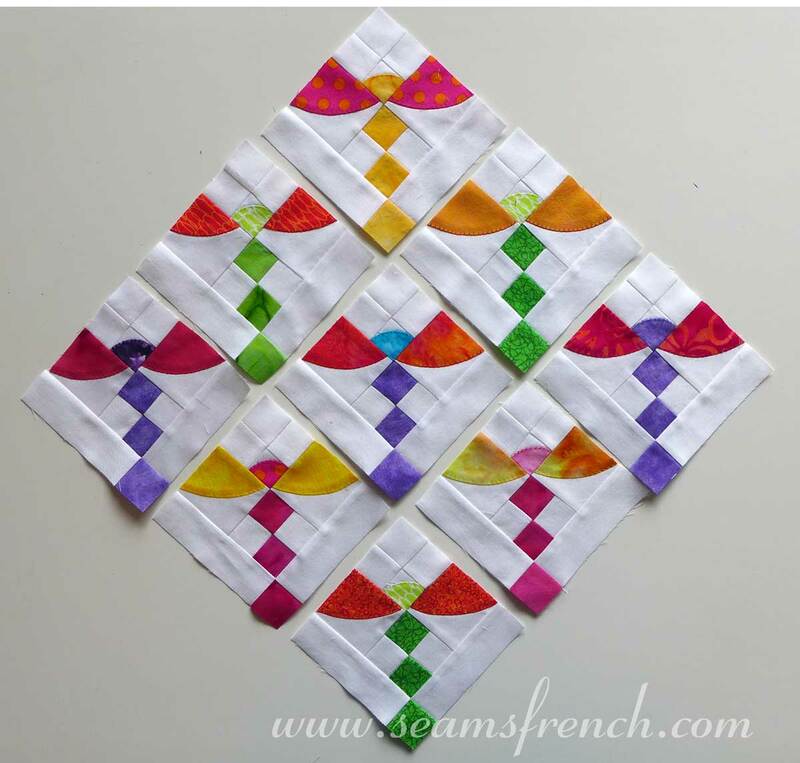 Yes, I think the white sashing will show off all your really creative block designs. It's going to be tremendous! And it doesn't have to be for a kid -- with a little more white space and some of your gorgeous quilting, it would be quite adult too. Thanks Monica. You're right, the colours don't have to be for a kid, but we seem to be in that round of life where nieces, nephews, friends kids, etc. are all having babies. SO having an extra quilt or two around won't hurt. I like the white sashing as well, but still have tons of coloured strips to deal with. I'll let it evolve the way it wants. Aren't these blocks turning out beautifully! So colourful and using white really sets them off, so crisp and modern looking. Well done!! Thanks Jocelyn. I think I'm partial to the white as well. Lovely cheerful colours and I like your mix of butterflies, dragonflies and bugs. All your options for settings have something to be said for them, so I'll watch with interest to see what happens next.